NEW DELHI/ISLAMABAD (Reuters) - Saudi Arabia's Crown Prince Mohammed bin Salman is expected to announce investments in energy and infrastructure during a visit to India and Pakistan in coming days as part of his efforts to wean the Saudi economy off oil exports. The prince is expected in New Delhi next week, along with leading Saudi businessmen, at the invitation of Prime Minister Narendra Modi, India's foreign ministry said on Tuesday. Pakistani Prime Minister Imran Khan was among a handful of leaders who attended an investment conference in Saudi Arabia in October, an event boycotted by many companies and world leaders in protest over Khashoggi's killing. India's Modi met the prince in November, when they were both in Argentina for a Group of 20 summit. 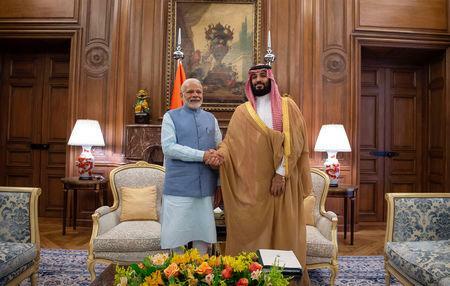 Saudi Arabia is India's top supplier of crude oil but the two countries have expanded ties beyond energy, and their governments have agreed to build a strategic partnership, the foreign ministry said. However, progress on a $44 billion refinery that Indian state-run oil companies agreed to build with Saudi Aramco on India's west coast has been held up by strong opposition from mango farmers who will lose their land. "They’re looking at the energy sector, at some of our privatization plans that they might bid for through our privatization process," Pakistani investment minister Haroon Sharif told Reuters. Sharif, who chairs Pakistan's Board of Investment, said there was also Saudi interest in Pakistan's mining sector. "Saudi Arabia has huge resources. Their investment fund is over $1 trillion, so we want just a fraction of that," said a second Pakistani minister, who did not wish to be named.